Every year, September is observed as National Childhood Cancer Awareness Month in the United States. But, "awareness" is only one part of the equation. At the National Brain Tumor Society, we believe we should provide resources AND calls to action. As such, we've helped craft the Childhood Cancer STAR Act, which will help fund and expand pediatric cancer research to improve survival and quality of life, and we need your help to get Congress to support it. Additionally, we have partnered with the V Foundation to fund brain tumor research. By joining forces, we’re redoubling our efforts to find new treatments and an eventual cure to pediatric brain tumors, which are the number one cause of cancer-related deaths in children under 14. 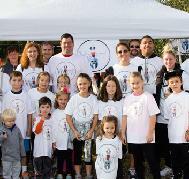 National Brain Tumor Society has committed one-third of all its fundraising to pediatric initiatives. But we can’t do it without you. Please consider giving a gift today.